The Endurance Sports Expo -- the largest cycling, running and triathlon expo in the country -- is expanding its popular show to connect more endurance athletes with the latest gear, training services, industry experts and event information for the upcoming season. The third annual Philadelphia expo returns to the Greater Philadelphia Expo Center in Oaks, PA on February 25-26 joined by a new show in the New York Metro area at the New Jersey Convention & Exposition Center in Edison, New Jersey on March 17-18. "The Endurance Sports Expo has become the premier pre-season stop for cyclists, runners and triathletes on the East Coast," said Matt Reece, co-producer of the Endurance Sports Expo. "With more than 250 vendors, outdoor demo area, and Endurance University, ESE is a one-stop show for athletes to learn, experience and buy the latest endurance products. With the addition of our second Expo in the New York Metro area, we plan to help even more athletes improve their performance in 2012." In addition to the hundreds of vendors representing national and local brands, each expo location features an extensive outdoor demo area where athletes can take a spin on the latest road, mountain and triathlon bikes. Also, nationally recognized professional and Olympic athletes, coaches and industry insiders will share their expertise at Endurance University educational seminars. The full Endurance U schedule and guest appearances can be found at http://bit.ly/ESE2012. For more information or to purchase tickets, go to http://bit.ly/ESE2012. Tickets are $8 online in advance or $12 per day at the door. Expo hours are 10 am - 5 p.m. on Saturday and 10 am - 4 p.m. on Sunday. The first 750 attendees each day will receive a "swag bag" full of giveaways from vendors and sponsors. Official event sponsors to date include Eastern Mountain Sports, Liberty Sports Magazine, High Road Cycles, USA Triathlon, Fuji, Kestrel, SheROX Triathlon Series, PHLYTRI and Ironman 70.3 Pocono Mountains. 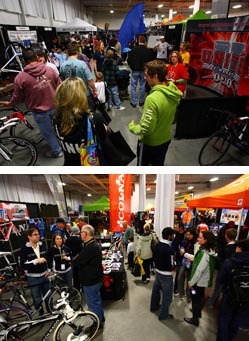 The Endurance Sports Expo is owned and produced by High Road Cycles of Wayne and Doylestown, PA, and Liberty Sports Magazine -- Your local guide to Cycling, Running & Triathlon.